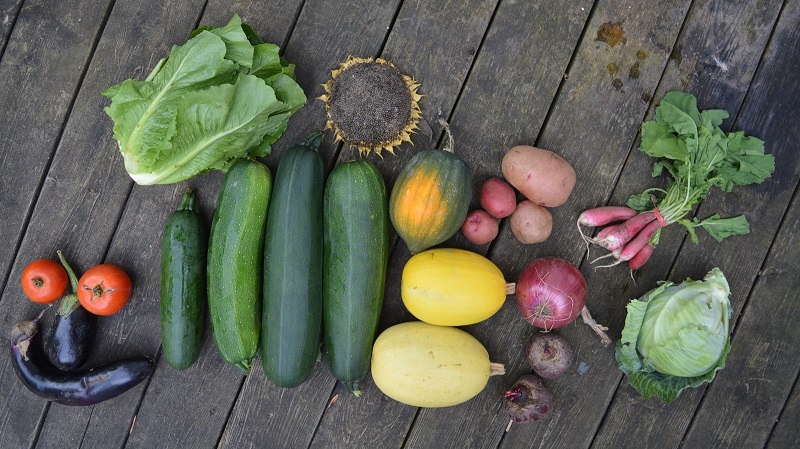 Week 14 Community-Shared Agriculture (CSA) Box (or what this holistic nutritionist ate last week) – Ashleigh Grange, R.H.N. Week 14: the leaves are turning glorious shades of red, orange and yellow, falling and landing amidst the last tomatoes and peppers. I, for one, am eager for cooler fall temperatures. Snuggling under cozy blankets, homemade pumpkin spice lattes, slurping more soups, squash and other warming, grounding foods. Ideally I would enjoy some warm days interspersed with cooler temperatures… And winter would only finally come in March for a mere two weeks before spring arrived to herald another season of growing fresh organic food. Alas, that’s far from the Canadian reality in my neck of the woods. From top to bottom, left to right (mostly): Tomatoes, eggplant, romaine, zucchini as big as baseball bats, sunflower seeds ripe and ready for the birds, acorn squash, spaghetti squash x 2, potatoes, 1 softball-sized cooking onion, red beets, breakfast radishes, green cabbage. This week I had some help in the kitchen. My friend Alma was by to spend a day in the kitchen, cooking up treats and making the most of our summer produce. 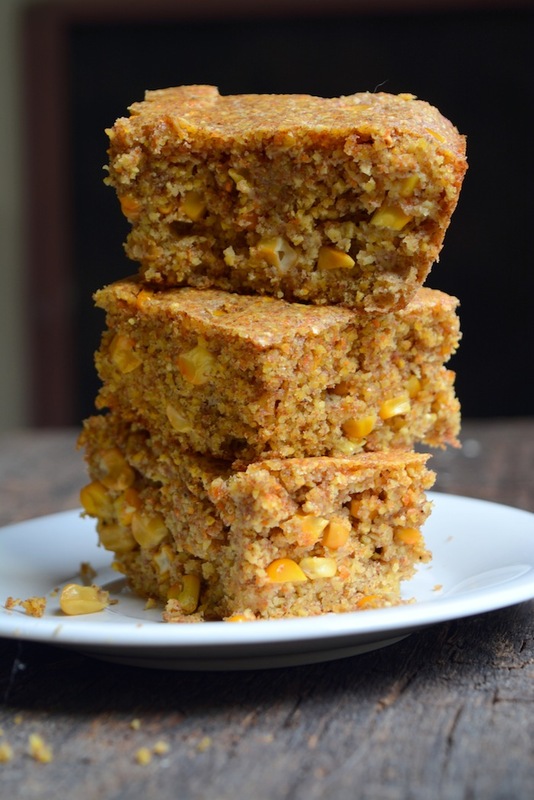 We made a super fluffy spelt cornbread, studded with fresh kernels we cut off the cob and inspired by a recipe from one of my very favourite cookbooks, The Rodale Whole Foods Cookbook. 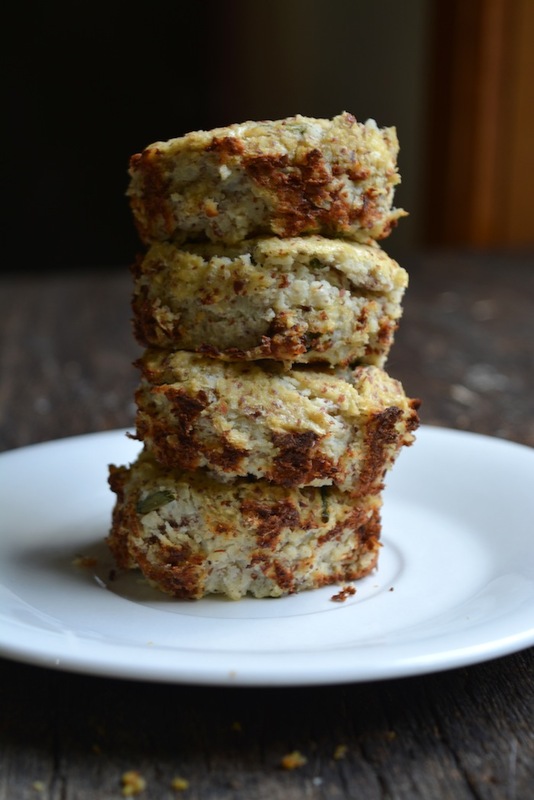 We also made these adorable grain-free, paleo-approved cauliflower biscuits. No flour, just cauliflower processed in the food processor until it was the size of rice, mixed with eggs, some ground nuts and spices and then pressed into a buttered/oiled muffin tin. They tasted great and held together nicely but stuck horribly to the pan. Sadly, my muffin tin is still being scrubbed even after days of soaking! I didn’t exactly follow the recipe because we did a half batch and we added our own seasonings and flavours but we were inspired by this recipe for Cauliflower Biscuits. I also made baba ghanoush: I charred the eggplants and pulsed everything with lots of garlic, organic tahini (sesame paste), salt, cumin and some paprika. It was not authentic in any way but I left the skins on so it was richer in those fabulous purple antioxidants called anthocyanins. Easy and a great dip or spread. 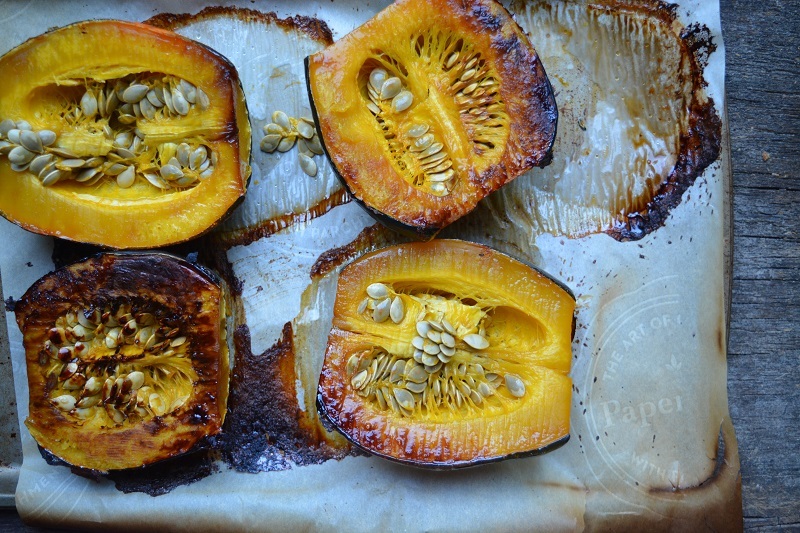 I roasted the squash and froze it… It may go into a winter soup or smoothie! 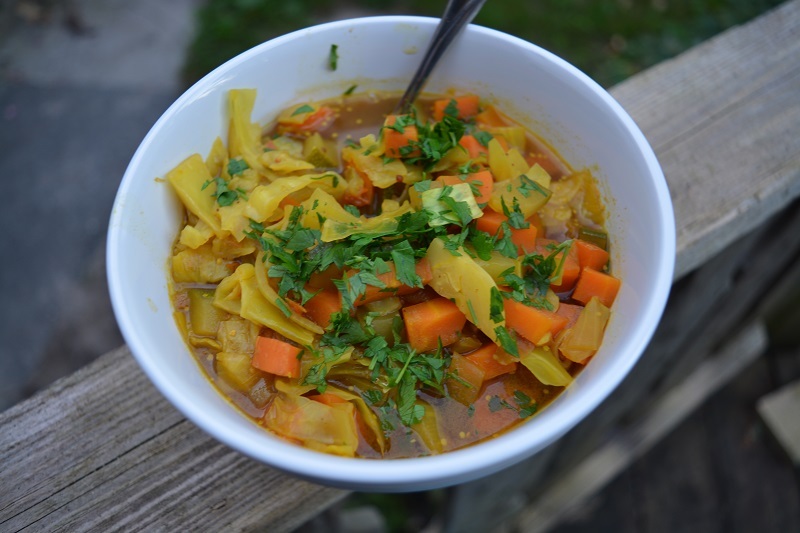 The green cabbage and (some of the) zucchini made a home in this mustardy spiced cabbage and summer veg soup. Onions, carrots, cabbage and zucchini all cooked until tender, then spiced with sun-dried tomatoes (blended with water), cumin, turmeric, chile, whole mustard seeds, sea salt, pepper, and topped with a generous handful of chopped parsley. Unbelievably filling and cooked cabbage is actually one of my favourite things. Odd, yes. Tasty, also yes. Warming, grounding, and oh so necessary right now… and it is what’s for dinner tonight! This entry was posted in Garden & Harvest, Local Food and tagged acorn squash, beets, cabbage, community shared agriculture, community supported agriculture, edencrest farms, eggplant, farm share, food share, local food, onions, organic food, potatoes, radishes, romaine, seasonal eating, seasonal food, spaghetti squash, tomatoes, zucchini. Ha! Your smiley face eggplant and tomatoes is awesome.